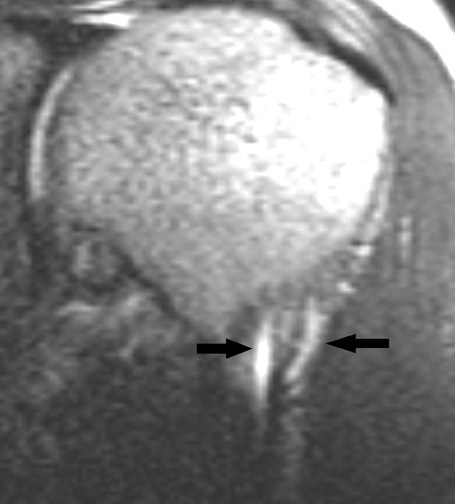 MRI showed an incidental finding of splitting of the biceps tendon at the level of the bicipital groove and reattachment at 2 cm distal to the bifurcation. 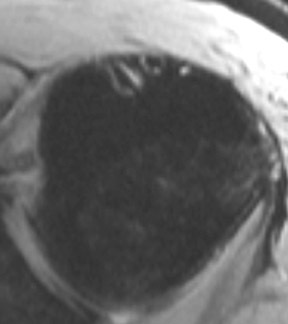 There was mild fluid in the tendon sheath around each bifid branch of the long head of the biceps tendon, which made it easier to appreciate the split. 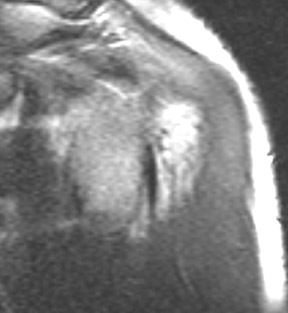 Other findings in this case included partial tear of the supraspinatus tendon and superior glenohumeral ligament (not shown). Several anatomic variations in the origin of the long head of the biceps brachii have been observed. Some of these anomalies have been implicated as having a role in rotator cuff tendinopathy. The most frequent variation of the biceps brachii is in the number of muscle bellies, although supernumerary heads are frequent,2 absence of the long or the short head is rare.3 Supernumerary heads of the biceps brachii have been described as part of a 3-, 4-, or 5-headed biceps brachii.4,5 A third head (10%) to the biceps brachii is occasionally found arising at the upper and medial part of the brachialis, with the fibers of which it is continuous, and inserted into the lacertus fibrosus and medial side of the tendon of the muscle. 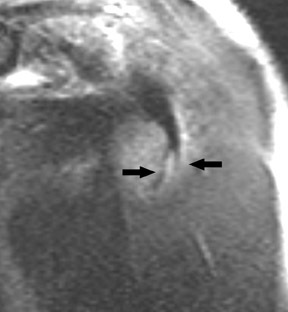 Rarely, a fourth head occurs, arising from the outer side of the humerus, from the intertubercular groove, or from the greater tubercle.1 There have been some other reports of unusual origins for the accessory long head of the biceps, such as originating from the pectoralis major.6 There have also been 2 reported cases with a bifurcate origin of the long head of the biceps tendon, which were incidentally encountered during diagnostic glenohumeral arthroscopy. 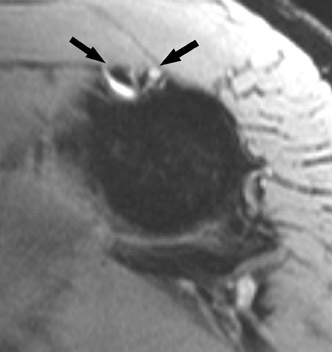 In both of these cases, one limb of the long head of the biceps was attached to the supraglenoid tubercle and the other to the posterosuperior capsulolabral tissue.7 This pattern of double heads, with separate attachment to the supraglenoid tubercle and posterosuperior capsulolabral tissue, is also reported by Vangsness et al.8 However, such a case with splitting and reattachment of the long head of the biceps brachii has never been reported. Although multiple heads or bifurcation of the biceps tendon had been described previously, this is the first report and MR demonstration of this pattern of splitting and reattachment of the long head of the biceps brachii in its course in the bicipital groove. Bannister LH, Berry MM, Collins P, et al. Gray’s Anatomy. 38th edition. Churchill Livingstone. 1995:843. Bergman RA, Thompson SA, Afifi AK, Saadeh FA. Compendium of human anatomic variation. Baltimore: Urban & Schwarzenberg.1988;11. Pina L. Atrophie de la longue portion du m. biceps brachii. Bull Mem Soc Anthropol Paris. 1929; 10:40–41. Asvat R, Candler P, Sarmiento EE. High incidence of the third head of biceps brachii in South African populations. J Anat. 1993;182:101–104. Sargon MF, Tuncali D, Celik HH. 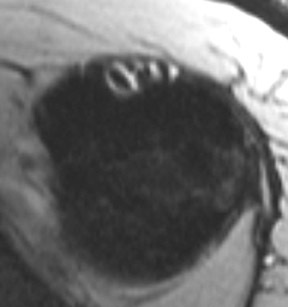 An unusual origin for the accessory head of biceps brachii muscle. Clin Anat. 1996; 9:160-162. Vangsness CT Jr, Jorgenson SS, Watson T, Johnson DL. The origin of the long head of the biceps from the scapula and glenoid labrum. An anatomical study of 100 shoulders. J Bone Joint Surg Br. 1994;76:951-954. 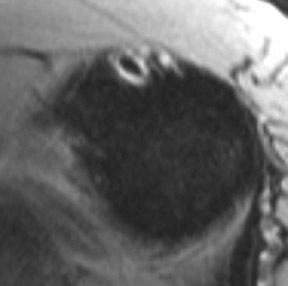 Borghei P, Tehranzadeh J. MRI differentiation of congenital bifurcation and traumatic longitudinal split tear of the long head of biceps tendon. RSNA Educational Exhibit, Chicago, Nov.-Dec. 2009. 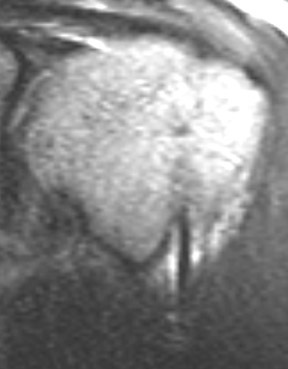 Bifurcation of the long head of the biceps brachii. Appl Radiol.